Although rivals were wary of Ferrari’s pace down the straights in Shanghai, it was Mercedes who claimed pole position and the grand prix win. Hamilton raced to a straightforward victory on Sunday, his second for this season, while Valtteri Bottas came home in second place. Sebastian Vettel in third was seven seconds down the road, but never once looked able to challenge for the win. “I think we’re over-delivering a little bit at the moment to our true, true potential,” Hamilton said. He added: “I think with what we have, we are operating at [our] full potential. “But there will be more performance and improvements to come in the future, we will make steps forward. “I think [in Bahrain], you can’t say that we necessarily won on full merit because we weren’t quick enough to win the race, but things happened along the way and you have to put yourself in position to get the wins, and we did that. “I think [in Australia and China], it’s full-on merit. 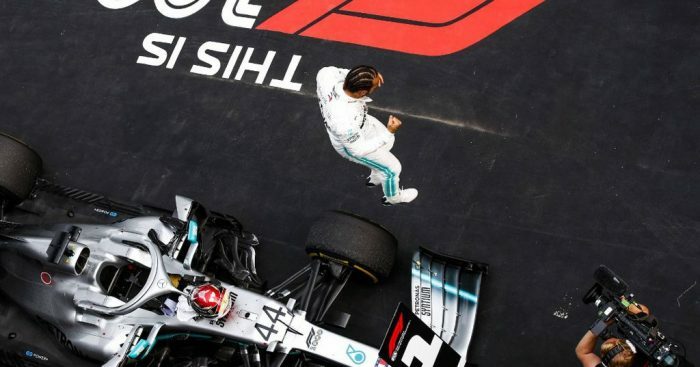 Three races in and Hamilton is leading the Drivers’ Championship with 68 points, six ahead of Bottas while Red Bull’s Max Verstappen is third, a further 23 points off the pace. “We’re not getting ahead of ourselves, we’re naturally keeping our heads down and working,” Hamilton added. “But we’ve got another close battle on our hands. “I don’t know where the Red Bulls were but I know that the Ferraris are right there. I think we’ve got races coming up that could potentially suit them more. “We didn’t expect to have the [advantage] in Melbourne, we didn’t expect to have the deficit [in Bahrain] and we didn’t expect this weekend to have the bit of advantage we had here. So it’s still up in the air. “But ultimately as a team we’ve collectively performed, and we’ve really, really delivered on the weekends so we’ve just got to continue to do so.